If you’re a landowner, safe and affordable resource management is one of your highest priorities. Keeping your land free from scrub and neatly maintained can be challenging. If you’re looking for an alternative to person-powered machinery or herbicides, consider hiring the herd from Healing Hooves. 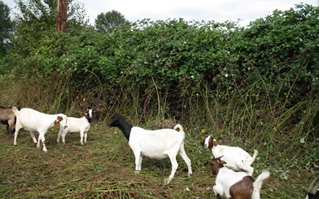 Healing Hooves maintains a healthy herd of goats that will graze your land and rid it of invasive weeds and other vegetation. Using goats is the most natural form of land maintenance. They love steep hillsides, soft terrain, windy paths, and rocky roads, too. They aren’t deterred by poison ivy or other vines we find harmful. Goats may not be able to handle all of your land issues, but they may be a perfect addition to your integrated weed management plan for your property. Our herd is very healthy and disease-free. We select animals that are good natural foragers and who are able work on all types of terrain. There’s another benefit to goat land managers: they’re fun to watch. Your crew and your family will love watching the herd at work (to them, it’s play) and hearing their gentle “bleats” as they call to each other. Shepherd Craig Madsen guides the herd and will work with you to achieve your land maintenance goals.